Pith ball for demonstrating Electrostatic energy, when the rod is rubbed with silk it generates a static charge which attracts the ball when placed in its proximity. Invented by British weaver's apprentice John Canton in 1754. This model was used by schools from the 1950's, and made by Philip Harris Ltd. The basic Crookes tube is a glass tube closed of at each end and an opening to evacuate the air. Two electrodes are sealed into the glass at each end, a voltage is placed across the tubes via the terminals and the air is gradually pumped out until a current is detect with amp meter. using this experiment scientist could learn the different characteristics of voltage flow in a vacuum. In 1855, Geissler invented the mercury vacuum pump thus making it possible to produce good quality vacuums in laboratory equipment. A Zamboni pile is an "electrostatic battery" and is constructed from discs of silver foil, zinc foil, and paper. Discs of approx. 20 mm diameter are assembled in stacks which may be several thousand discs thick and then either compressed in a glass tube. Zamboni piles have output potentials in the kilovolt range, but current output in the nanoampere range. The famous Oxford Electric Bell which has been ringing continuously since 1840 is thought to be powered by a pair of Zamboni piles. By means of a prism and viewing screen, illuminated by a torch bulb, the miniature scale can be read accurately. Air dampers in brass cylinders are used to stabilise the movement. Simple version of scales used in Laboratories and workshops. 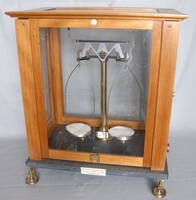 Model 142 Scientific Scales used by Chemists and Laboratories. The Tesla Coil was originally designed by Nicola Tesla in 1891 to produce very high voltages. His theories eventually lead to a possible means of transmitting power via a large aerial, replacing power lines, although the first aerial was made in America it never became a practicality. This is a model made for classrooms. In 1857, after examining a greatly improved version made by an American inventor, Edward Samuel Ritchie, Ruhmkorff improved his design (as did other engineers), using glass insulation and other innovations to allow the production of sparks more than 30 centimetres long. Ruhmkorff patented the first version of his induction coil in 1851, and its success was such that in 1858 he was awarded a 50,000-franc prize by Napoleon III for the most important discovery in the application of electricity. He died in Paris in 1877. Shown working, with the 6 inch spark. Ruhmkorff was born in Hanover. After an apprenticeship with a German mechanic, he moved to England. Biographies say that he worked with the inventor Joseph Bramah, but this is unlikely since Bramah died in 1814. He may, though, have worked for the Bramah company. In 1855, he set up a shop in Paris, where he gained a reputation for the high quality of his electrical apparatus. Electromagnetic induction was discovered by Michael Faraday (1791-1867). In 1831 Nicolas Callan (1799-1864) invented the Induction coil. In 1836 they were used for medical complaints such as skin disorders, and to power X ray machines. Marconi used one for his experiments prior to developing his system at Poldhu in Cornwall for the first transatlantic transmission. Coils like this were used in spark transmitter systems for the next 30 years. 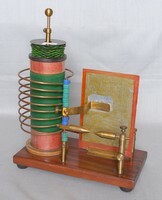 Later coils such as this unit, were made for schools and Colleges as demonstration units. In several of Jules Verne's science-fiction novels, so-called "Ruhmkorff lamps" are mentioned. These were an early form of portable electric lamp. 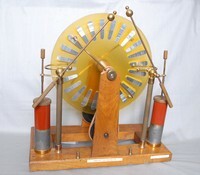 The lamp consisted of a Geissler tube that was powered by a battery-powered Ruhmkorff induction coil, an example of one (made much later)is shown here. The cell was invented by Georges Leclanche' in 1866, it is the forerunner of modern Zinc Carbon dry cells. In the centre is a porous cylinder filled with Manganese Dioxide and in the centre of this is a carbon rod. Outside of the cylinder is a zinc rod. The jar would normally be filled with Ammonium Chloride. The Positive terminal is the carbon rod and the zinc is negative. The voltage obtained is 1.5 Volts. Georges Leclanch� (1839 - 1882) was a French electrical engineer chiefly remembered for his invention of the Leclanch� cell; one of the first modern electrical batteries and the forerunner of the modern dry cell battery. The original form of the cell used a porous pot. This gave it a relatively high internal resistance and various modifications were made to reduce it. These included the "Agglomerate block cell" and the "Sack cell". The power source used by Thomas Edison for his perfected Phonograph of 1888. The Grenet cell was invented by the German Johan Christian Poggendorff (1796-1877). Called Grenet Cell because he made a practical version possible. Used as a source of power before the Dry Battery became available. It consists of three plates in a jar filled with 17 parts potassium dichromate dissolved in 100 parts of distilled water with the addition of 22 parts sulphuric acid. The two positive plates are made of retort graphite, the negative Zinc that can be raised or lowered into the solution; this prevents corrosion when not in use. These units come in varying sizes from 1/3 to 3 Litres. Used for the the detection of electrostatic charges. If a charged item such as a Ebonite rod that has been rubbed is held near the the brass terminal, the small foil leaf will deflect away from the mounting. 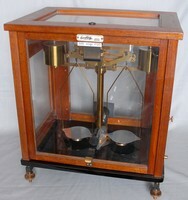 The Electroscope was used for the the detection of electrostatic charges. If a charged item, (such as an Ebonite rod that has been rubbed) is held near the the brass terminal, the gold leaf will deflect away from the mounting. Used for the the detection of electrostatic charges. If a charged item such as a Ebonite rod that has been rubbed is held near the the brass terminal, the gold leaf will deflect away from the mounting. 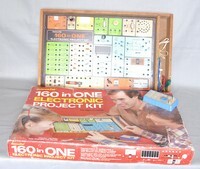 Hobby kit for children and adults to learn electronics. A popular pastime from the 1900's to the 1980's. A version of this equipment can still be found today, and is still used as a teaching aid. Microscope for medical and scientific use in laboratories and colleges. Complete with slides lens's and accessories. James Smith, a scientific instrument maker, commenced making microscopes in 1839 and took Richard Beck into partnership in 1847 trading as Smith & Beck at 6 Coleman Street, London. In 1851 Joseph Beck, the brother of Richard Beck, started working for the firm and became a partner in 1857 when the business name became Smith, Beck & Beck. When Smith retired in 1865 the business address was 31 Cornhill and the trading name changed to R & J Beck. Simple brass microscope, still in excellent working order, the wooden box is very basic. The Cross vacuum scale demonstrates the phenomenon of discharge at different pressures. The pressure in the tubes varies between 40 Torr (mm/Hg), the lowest vacuum in the left tube, to 0.03 Torr the highest vacuum in the right tube. It is in this high vacuum, used in many Crookes tubes, that X-Ray's are produced. A spectrometer is an optical instrument used to measure properties of light over a specific portion of the electromagnetic spectrum, typically used in spectroscopic analysis to identify materials. The variable measured is most often the light's intensity but could also, for instance, be the polarization state. This equipment uses the 'Spekker' Principal, a Registered Trade Mark. A spectrometer is an optical instrument used to measure properties of light over a specific portion of the electromagnetic spectrum, typically used in spectroscopic analysis to identify materials. The variable measured is most often the light's intensity but could also, for instance, be the polarization state. Could have been used in experiments on Magnetrons. One tube Marked 6132 for Helium. One Marked 6130 for Nitrogen. The others marked Oxegen Hydrogen and Carbon Dioxide. Heinrich Geissler (1814-1879) The Geissler tube is a glass tube for demonstrating the principles of electrical glow discharge. The tube was invented by the German physicist and glass-blower Heinrich Geissler in 1857. The Geissler tube was an evacuated glass cylinder with an electrode at each end, it would contain one or more of the following rarefied (thinned) gasses, such as neon, argon, or air, mercury or other conductive liquids, or ionizable minerals or metals, such as sodium. When a high voltage is applied to the terminals, an electrical current flows through the tube. The current will disassociate electrons from the gas molecules, creating ions, and when electrons recombine with the ions, different lighting effects are created. The light will be characteristic of the material contained within the tube and will be composed of one or more narrow spectral lines. 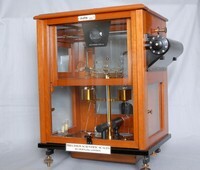 The museum has several Geissler Tubes which can be demonstrated. Used in class rooms to demonstrate high voltage effects on evacuated tubes,or Cathode Rays. Sir William Crookes circa 1875. (1832-1919) The Railway tube or Paddle Wheel demonstrates Kinetic Energy. the paddle wheel and move from one end of the tube to the other. Crookes thought that Cathode Rays had momentum, but in 1903 J.J.Thomson proved that the rays hitting the paddle heated the gas on that side causing it to expand, as the gas on the other side remained cool, the vane moved away from the ray. Used to demonstrate cathode rays. A negative voltage is connected to the small end and a positive connected to the cross. The tube is evacuated of air, and when the voltage is applied, electrons (cathode rays) travel from the small electrode towards the cross, some hit the cross while others carry on and illuminate the end of the tube leaving a well defined shadow. This was the first cathode ray tube, probably attributed to Johann Wilhelm Hittorf in 1869, the same period as Crookes was experimenting. Geissler tubes, were named after the man who first devised them (1814-1879), to demonstrate the effect of high voltages on different gases or air that has been rarefied. This one would have been made for a University or College. The Geissler tube is a glass tube for demonstrating the principles of electrical glow discharge. The tube was invented by the German physicist and glassblower Heinrich Geissler in 1857. The Geissler tube was an evacuated glass cylinder with an electrode at each end. 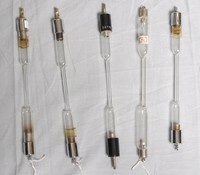 A Geissler tube contains one or more of the following rarefied (thinned) gasses, such as neon, argon, or air; mercury or other conductive liquids. When a high voltage is applied to the terminals, an electrical current flows through the tube. The current will disassociate electrons from the gas molecules, creating ions, and when electrons recombine with the ions, different lighting effects are created. The light will be characteristic of the material contained within the tube and will be composed of one or more narrow spectral lines. 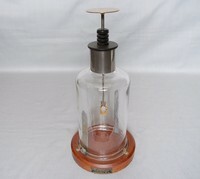 Used in class rooms to demonstrate high voltage effects on evacuated tubes and enclosed crystals. Sometimes referred to as a 'Cows Udder'. Used in class rooms to demonstrate high voltage effects on evacuated tubes and Chemicals. The butterfly is made of metal, coated in different minerals, when the electrons hit the elements they glow in the associated colour for that type. The principal is similar to a modern fluorescent tube. We can demonstrate this item in the museum along with a number of other electrical objects. This electrostatic device was invented between 1880-1883 by British inventor James Wimshurst. It was used for generating high voltages, the machines were frequently used to power X Ray tubes. The Wimshurst Machine belonged to a class of generators called influence machines, they separated electric charges through electrostatic induction or influence. 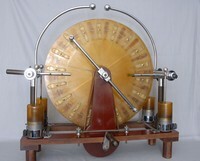 The Wimshurst Machine is self-starting, meaning it doesn�t need external electrical energy, it does however, need mechanical power and by turning the handle very quickly the two glass disks and their metal sectors rotate in opposite directions passing the crossed metal neutraliser bars and their brushes. Wimshurst built these machines between 1880 and 1883. This unit was used in schools and colleges up to the early 1980's and is not antique although they are now seldom seen. It was used as a training aid in a subject that is no longer considered important in a world of computers. The two disks rotate in opposite directions when the handle is turned. Strips of foil on the disks are rubbed with two wire brushes, static is picked up by prongs positioned close to the disks and stored in two jars (Leyden Jars). When the charge is sufficient a large spark discharges the stored energy across a gap by two brass rods.